My grandmother has always been a believer in prayer. Any time anyone in the family lost something, she would say a prayer to St. Anthony. St. Anthony, St. Anthony, please come around. Something's been lost and cannot be found. Somehow, each and every time, whatever is missing turns up not long after saying this prayer. Personally, I think my grandma must have a special relationship with St. Anthony; some kind of deal, maybe. Because as no-fail as it is for her, I still seem to legitimately lose things that are never, ever found. Somewhere out there is a collection of cards, dollar bills, glasses, and ear buds never to be found again. One thing that seemed to be lost until recently was a season called spring. But finally it seems that spring has arrived complete with thunderstorms, birds chirping, and fresh, green grass. I was reminded the other day of the spring festival that took place around this time at the school where we worked in Tokyo. Many countries were represented and served food and drinks like lamb from New Zealand to Caipirinhas from Brazil. We would stand outside and eat and drink and laugh, our shoulders and cheeks turning pink with the first sunburn of the season. It was always such fun and felt like a celebration of everything that had happened in the months leading up to that day. The first time I attended the festival, I was introduced to Pimm's No. 1, a liqueur from England. It was served in clear plastic cups with loads of diced apples, cucumbers, and mint. The pleasant, refreshing flavor was something I didn't realize existed in the world of cocktails. When Pimm's wandered into my mind a few days ago, I new I needed to have a bottle in my at-home bar collection. While I love the flavor and appearance of all the diced fruit that goes into a Pimm's Cup, I decided to simplify a bit. When you're making a cocktail for one, it seems like a lot of work to chop a bunch of stuff, doesn't it? Especially if it's been one of those weeks where the dog had to get the "cone of shame" because of a paw injury and the toddler has been practicing his climbing skills by dancing on the coffee table. And the cone-head dog always joins in. At the end of a week like that, you want something that requires little effort but has a big payback. Yes, ginger beer is quite strong but in the proper proportions, it works well with Pimm's. 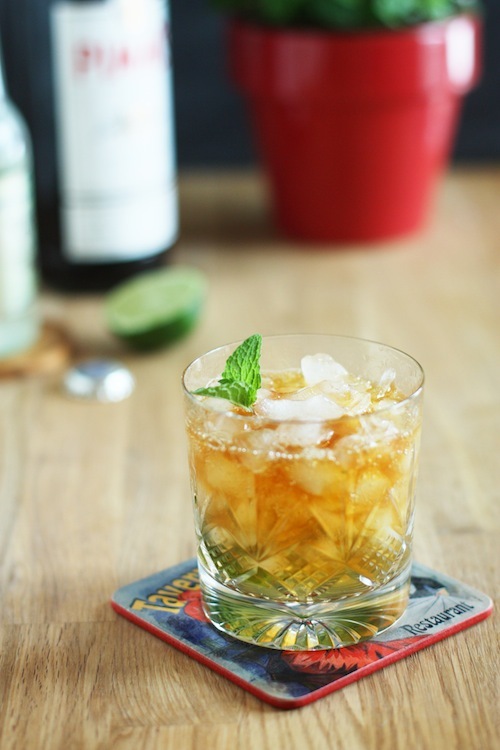 The spicy ginger kick is actually really wonderful with the light fruit and herb flavor of the iced-tea colored liqueur. 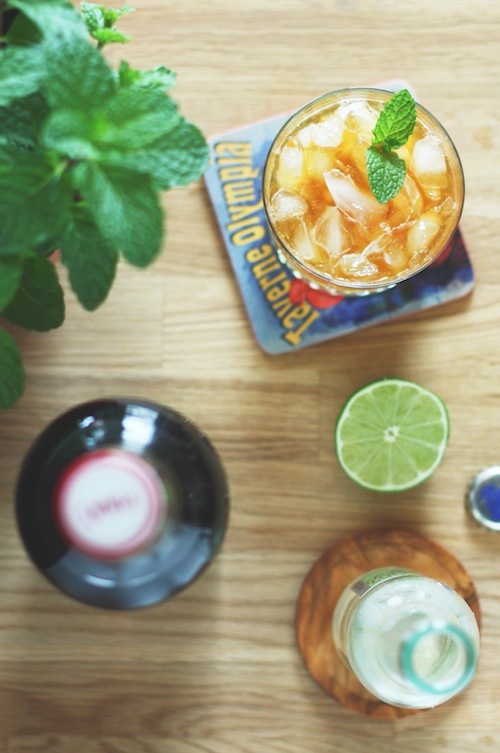 A little fresh mint and lime juice and you've got a daper drink indeed. What are your go-to methods for retrieving something that is lost? I think St. Anthony came through when it came to the case of the Lost Spring, but I'm always looking for backup ideas for when I lose my keys. Or my glasses. Or whatever it may be. Muddle the mint leaves and lime juice in the bottom of a cocktail shaker. Add the Pimm's and stir to combine. Strain into a short glass filled with ice. Top with the ginger beer and stir lightly to combine. Garnish with mint leaves and/or a lime wedge. Serve and enjoy!